Looking for a design tool to design your next calendar or booklet? We have recently upgraded our Calendar and Booklet design tools so they are now better then ever! After clicking the product link below, you will be sent to our website's product page. From there, all you have to do is click the pink "Online Design Tool" button under "Need Design Help?" 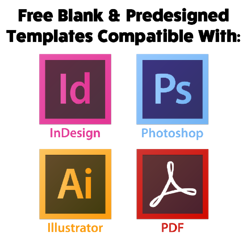 We have free blank downloadable templates available for the Adobe Creative Suite. If you have InDesign, Photoshop or Illustrator, download our templates and they can be edited in those programs. You can also download a PDF file for use in other programs. It's simple, just click the link to the right for the product you're looking to get printed and you will be directed to the free templates for that product. Are you printing a booklet and want to jump start your design? Try out our free predesigned booklet templates! They include 35+ page layouts and are perfect for booklets, catalogs, yearbooks, magazines, photo books and more! Click here to see our predesigned templates.